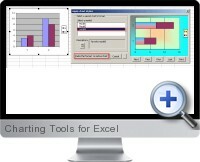 With the Charting Tools for Excel add-in you will be able to: Copy and paste format from one chart to another one; Re-size and save charts; Add new images; Add and move labels; Quickly configure the most common tasks in your spreadsheet work; and more. Copy and Paste Format - Both tools supplement each other. While Copy Format copies chart formatting to the clipboard, Paste Format applies such copied formatting to other chart. Save Selection - This tool let you to save a chart or an other selection in a file. Add Label - Add labels to your charts with this tool, either to them all or to selected ones. Move Labels - Use this tool to move the labels already posted in a chart. Add Images - Add images to series points in your charts with this tool. Re-size Charts - Re-size your charts with this tool (e.g. make them all the same size). Toggle settings - Save valuable time doing repetitive tasks. For example, to hide the headings in several sheets of the Workbook, instead of doing it one at a time,this powerful tool can automate it to save time. Tips - This tool has a tips system that will help you to accomplish some useful tasks.